A day of rest in Dugouts, water and petrol supplies ready, then more water in the back and I finally headed north-east to take a look at one of the places still considered legendary among survivors – the lonely Uluru towering over its surrounding plains. You might wonder why the hell would anyone go into the middle of the desert – a piece of rock is hardly worth the trouble. Yes, it looks truly impressive changing colors depending on time of the day like a beauty choosing a different dress, but wasting resources on sight-seeing ended with the Scourge. However, I have heard lots of strange rumors about this place from vagabonds and wanderers such as myself. That is why I finally decided to see everything with my own eyes. 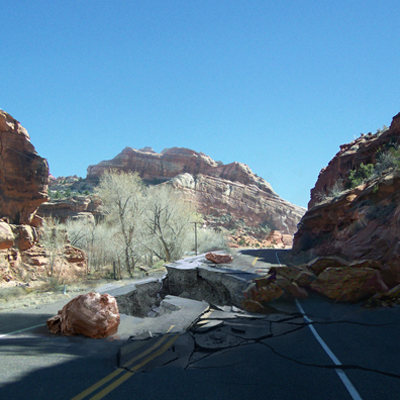 I encountered some serious obstacles 50 or 60 kilometers away from the mountain. Clearly marked route leading away from the highway abruptly ended with a fallen overpass, forcing me to look for an alternative path through a rough terrain. The construction had not simply collapsed – it seemed someone had demolished it using explosives. 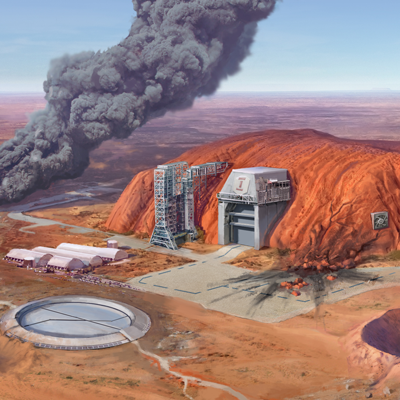 Once I got closer – close enough to see Uluru looming in the distance – it turned out another barrier awaited. It was a sturdy steel fence crowned with coils of razor wire, stretching as far as I could see. I drove along and reached a locked gate and a gravel road leading toward the mighty rock through a sandy plain riddled with craters and sinkholes. At that very moment I heard a buzzing sound – a camera installed on top of a gate post had swiveled and caught me in its inquisitive lens. A red diode was flashing ominously… A couple of minutes later I noticed a cloud of dust approaching my position. One look through my binoculars and I was inside my car driving the opposite direction – an armored vehicle painted in old Australian army camo was heading toward me at full speed. Its autocannon was big enough to discourage anyone from trespassing. I guess I will have to come back there after some serious preparations. As for now, it is time to face the last leg of my journey. Waste Knights: Second Edition on February 19th on Kickstarter!